You guys, can I just start off by saying that I am pro-international/destination weddings forever and always? I just want to put that out in the universe in hopes of crossing paths with some more adventurous couples out there - I’ve got you! So, onto the good stuff! Sam’s vision was something I really jived with right off the bat - bohemian overgrown garden with a nod to the traditional English garden. Lots of blush and whites with whimsical pops of peach and orangey goodness. Pretty much one of my favorite color schemes - maybe because I was a major Flintstone Push-Pop enthusiast as a kid? Probably. Anyway, there were bright greens and lots of texture in Sam’s vision and I couldn’t be happier about it! Dare I say, peachy keen? The wedding was beyond compare. The weather was perfect, the mimosas delicious and the people spectacular. The venue was on a four-acre organic farm with rustic Mexican decor. In the midst of kale beds lived the trellis where Jovan and Sam got married. That dress, his smile, the garden - all things lovely! Talk about a stunningly gorgeous and blissful ceremony, I can’t stop thinking about it. After the ceremony, we made our way through the buffet filled with the bounty of the land - yum! More beautiful weddings like this please! All in all, it was an adventure and a half working this wedding, such a blast! Shoutout to my hubby (turned assistant) and his ability to power through anything! Seriously, the man is a beast. Throughout the two days, we managed to squeeze in some good eats at local restaurants, the best fuel! If you ever find yourself in Tecate, do yourself a favor and check out El Lugar de Nos. We can’t wait to go back! I am so grateful to have had the opportunity to create pretty things for this wedding and to have such awesome clients that put their complete trust in me! Nothing makes me happier than seeing my clients excited and teary when they see their flowers - and this wedding did not disappoint. Best wishes to Jovan + Sam on their adventures together, forever and always! Hello, hello! You guys, it’s been a solid ten years since I last blogged, and by “blogged” I mean publish my thoughts on terra cotta for my humanities class in tenth grade. Yeah, something everyone wants to read about, right? Mhmm. 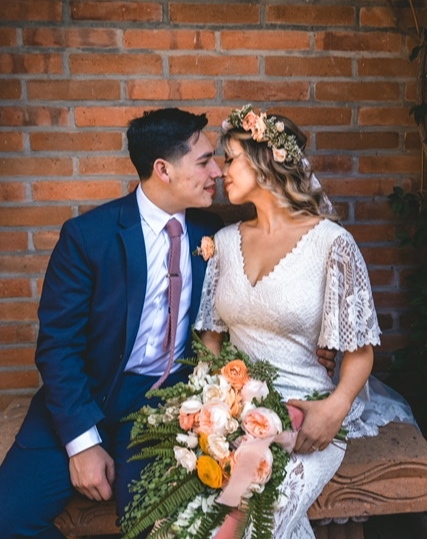 That being said, I am beyond excited to write about all things flowers, the amazing couples I work with and maybe a few helpful tips here and there for fellow flower homies and couples who are looking for a florist. Yay! Back in October, a bride got in touch with me because her and her fiancé were eloping in three days, in a hot air balloon, in Del Mar! How spectacular does that sound? So dreamy. Anyway, this adorable French bride wanted something different and unique to her love story. She wanted something romantic yet bright, and so we married the two (pun intended)! I love(d) this bouquet. To this very day, I have warm fuzzy feels for it deep down. Those coral charm peonies were huge, the dahlias were saturated with these sunset tones and the delphinium were an out-of-this-world blue. The Japanese butterfly ranunculus were these perfect iridescent nougats that made the bouquet that much more special (+ boutonnière really pop). Ugghhhhh, I can stare at these pictures all day, they’re too beautiful! The oh-so-talented Luisa Renay captured this couple and these flowers to perfection. I am eternally grateful to her for referring me to this couple, without ever meeting each other! It’s a big deal. The Instagram community has been so welcoming and so much more positive than I was anticipating. The support has been astounding - creatives and locals! I am so excited to have more opportunities like this in the future. If you are eloping and want some stunning florals, let’s get in touch, you can get in on this action too!